Stormzy, just like Kano, has fooled most if not all of us. The latter, prior to the release of last year's Made in the Manor, released a succession of tracks – ‘Three Wheel-Ups’, ‘Hail’, ‘Flow of the Year’ - that were relentlessly up-tempo and laden with swagger. We might then have thought that the LP to follow would be aimed primarily in the direction of the dancefloor. In the event, that album turned out to be one of the most emotionally vulnerable releases that a British MC has ever produced; and, if anything, on Gang Signs & Prayer Stormzy has reached even further into his own soul. The 23-year old was riding a wave of the greatest possible momentum last year when he sharply withdrew from public view, for reasons that were unclear; it now seems, from various references on his album, that he was struggling with personal loss and a closely-related crisis of faith. When Stormzy re-emerged from the shadows with ‘Big for your Boots’, we could have expected a further succession of tunes in the vein of ‘Shut Up’. But what Stormzy has given us is as much gospel as grime – as much grace as grit. From some of his earlier records, we knew that he was given to sensitivity, but here he even weaves duets in amongst the festival anthems, singing proudly and gratefully as a recently-saved soul on Sunday morning. Like the very best albums - and this, at the very least as far as his genre goes, is certainly one of them - the tracklisting is finely crafted. We're never allowed to rest too long with one of Stormzy's guises; one moment he's scowling on ‘Mr. Skeng’, the next he's lovelorn and melancholic on ‘Cigarettes and Cush’. He's bulletproof on ‘Bad Boys’, and then prostrate before the Lord on ‘Blinded By Your Grace Pt.1’. Speaking of ‘Bad Boys’, it speaks much for both Stormzy's confidence and humility that he gives Ghetts the closing verse here – because, naturally, his guest lights it up with one of his best interventions since his spot on Wretch 32's ‘Ina Di Ghetto’. And as if this weren't enough, the track is laced with a mighty hook from J Hus, the anticipation of whose own record has just soared up a notch. There are many rappers who reach for heartfelt songs to balance their harder output, but with Stormzy – as with Dave, his similarly introspective peer – it never feels forced. For ‘100 Bags’, an ode to his mother, he follows in the tradition of Tupac's ‘Dear Mama’, inevitably - and movingly - singing the chorus himself. He then renders Croydon - yes, truly - as beautifully as you will find it anywhere on record, his hymn to a town he is leaving behind accompanied superbly by Raleigh Ritchie on ‘Don’t Cry For Me’. This is a record of remarkable range and often startling beauty, crystalised on ‘Lay Me Bare’ – its stunning final track. There is fury at those who are family only in name, and there is almost overwhelming grief at a departed friend; and here, as everywhere else, the prose is visceral and vivid. Like Kano's most recent record, Stormzy's debut is a Trojan horse: you come for the chanted choruses and then, in the most life-affirming sense, you end up in church. All great albums are marked by their texture, their variety; and here Stormzy roams between rave MC and repentant sinner, between (to paraphrase Dave) gentleman and gangster. 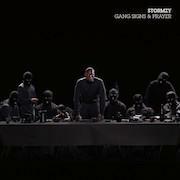 It may be too early for most to declare it a classic, but only a few hours after its launch, it seems fair to describe Gang Signs & Prayer as a towering triumph.